To know prices and availability online you can use our booking engine or contact us directly. Minimum booking 5 nights for accommodation for 2 to 5 people in Deluxe Two-roomed apartment with check-in on Sunday from 5 to 9 pm and check-out on Friday by 10 am. Minimum booking 7 nights nights for all accommodation options with check-in from 5 to 9 pm and check-out by 10 am. Check-in opens at 11 am and from that time guests have access to all the complex's facilities. Accommodation is made available from 5 pm (guests who have already checked in and whose apartments are ready will be given access to them even before 5 pm). Check-out must be completed by 10 am, unless otherwise agreed. Direct booking: will help us to increase our independence from the booking platforms. 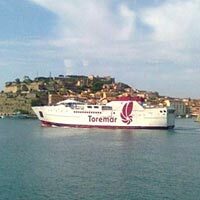 Discounts: guests who book directly will always receive benefits for all tariff periods and will enjoy the best terms offered by the complex and by the MOBY - TOREMAR ferry company. Ferry discount code: on confirmation of the booking, you will receive a code for a 20% discount on the on-line purchase of ferry tickets for a car and passengers (valid for bookings made directly from our site). Discount card: discounts for restaurants and services. Services included: electricity, water and gas consumption. For use of private parking space, use of pool, final cleaning: € 69.00 per apartment. This compulsory supplement is added to the cost of the accommodation (even for stays of less than 7 nights). At every changeover our apartments are cleaned and sanitised by qualified staff. A swimming-pool, unattended, with sun-bathing area with lounger and deck-chair subject to availability is operational from 01/06 to 30/09; Open from 9 am to 1:30 pm and from 3:00 to 8:00pm. Rules apply, guests must shower before entering the water, bathing-caps must be worn and beach footwear is compulsory in the sunbathing area. No water toys or games. Access to the swimming pool is subject to the underwriting of responsibility discharge for the property and the pool manager. The kitchen area: does not have a non-stick frying-pan. The kitchen area must be returned as received; otherwise, a supplement of € 35.00 may be charged. Private parking space: every apartment is assigned an individual, unattended parking space. Close to the sea: about 350 metres on foot, a short 5-minute walk, to a free beach with option of beach umbrella hire and beach services at "Da Luigino" (not under our management): beach umbrella, sunbed or deckchair hire from € 3.00 per item, pets allowed, Tuscany Region regulations apply. Services provided: Sat TV, cooking area complete with cookware, built-in fridge in living area, table and chairs, walk-in wardrobe, bedroom plus shower-room and roofed terrace with table and chairs. Bed linen set hire: € 9.00 per person per change, comprising 2 sheets and 2 pillowcases for a double bed, 2 sheets and one pillowcase for a single bed. Towel set hire: € 12.00 per person per change, comprising 1 large and 2 small towels. Coverlet set hire: € 9.00 per person per change, comprising one coverlet. Prices of sets are per person per change; guests may choose whether to change the linen during their stay. Pets: allowed on request and with ID card (max. 2 per apartment) with an extra charge of € 10,00 per day per pet. Pets are not admitted in shared areas and swimming pool. Washing-machine: one use of washing-machine with maximum load 8 kg costs €8.00. Tennis court: € 10,00/h. for 2 players, with lighting € 20,00/h. Guests are required to pay a deposit of 50% of the total cost at the time of booking with the balance 30 days prior to arrival (100% if booked 30 days before arrival). If a booking is cancelled 60 days before arrival, 20% of the total cost of the stay will be withheld, 50% from 59 to 31 days before arrival, and 100% from 30 days before arrival. No cancellations or changes are permitted; the entire cost of the stay will be charged in case of early departure. Deposit to cover damage: € 100.00 per apartment (door opening, lost keys, remotes, Sat-TV card, kitchen area).